The editors of The Curbside Chronicle make room in every issue to share personal stories from Curbside vendors, as their goal to document the challenges of homelessness. Homelessness can be an extremely difficult path and going it alone is never easy, which is why readers might notice that some of the magazine’s vendors have pets. 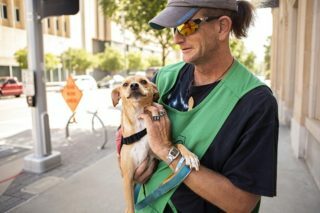 In a series of conversations with Curbside vendors, we find out more about the furballs who have wagged their way into vendors hearts and become an integral part of the Curbside community. 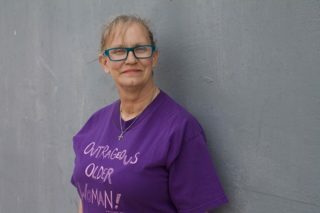 Rhonda, a vendor for Oklahoma City street paper The Curbside Chronicle, speaks candidly here about her childhood, upbringing, experiences of abuse, marriage and fighting her way back to housing. Curbside Chronicle vendor Steve talks in depth about his childhood, growing up, his experiences of homeless and what it is like to work as a street paper vendor in Oklahoma City. Curbside Chronicle vendor Bennie felt that life was passing him by due to his problems with drugs. 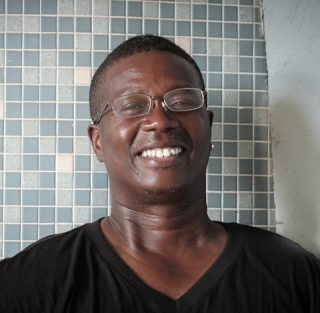 “Five months ago, I didn’t have no hope, but now I have hope” he says. 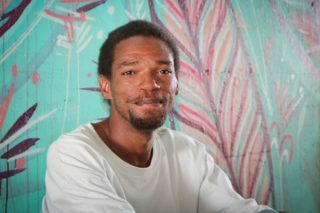 Though he wanted to be an astronaut as a child, Curbside Chronicle vendor Booker ended up hanging out with gangs as a teenager. He was jailed at the age of 24. While he was in prison, he finally learned how to read.